Runners and walkers huffing and puffing up the Tropical Park hill stopped and gagged when they reached the peak. Sure, it’s a steep climb by Miami’s terrain standards, but what really made them breathless was the severed cow’s tongue lying on the path. “Anybody could have tripped on that tongue,” said Caroline Galvin, who has been running and walking in the park for 40 years. In other cities, joggers avert dog poop. But only in Miami must they step around animal carcass offerings from Santeria worshipers. Galvin encountered the tongue, which was sliced in half, last week. Dead chickens, roosters, pigeons, goats, pigs – and anatomical parts thereof – have been found atop the hill that is popular with people who like to exercise in Tropical Park, high school runners who compete in meets at the park, kite-fliers and picnickers. 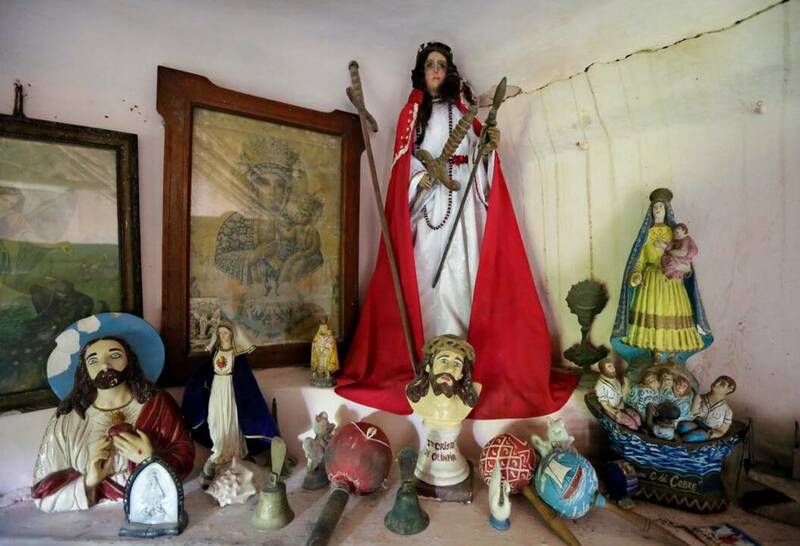 The Sociedad Santa Bárbara in Palmira serves as a living museum, a repository of history and current spiritual belief where the rites of the Lucumí religion, popularly known as Santería, are practiced much as they were during the times of slavery. Orishas are living spirits that must eat, so it is not uncommon in Miami to see a watermelon bobbing in Biscayne Bay, an offering to Yemaya, goddess of the sea and motherhood, or cucumbers floating down the Miami River, food for Ochun, goddess of the river and love. Visit the giant ceiba tree at the Bay of Pigs Memorial in Little Havana and you’ll find red roosters for Chango, god of fire, lightning, dancing, virility and leadership. Beneath royal palm trees, look for white chickens or yuca for Obatala, goddess of peace and creation. On the steps of the Miami courthouse, goats’ legs, pigs’ heads, bananas and mangos are among the items deposited in hopes of justice or revenge. At Miami City Cemetery, caretaker Ronnie Hurwitz finds cigars, coins, pastries, cups of espresso – gifts that could sway an orisha to grant a wish for wealth, health, romance. A Hialeah family called on Sandoval – not on orishas – to solve a problem decades ago “when there were still Americans living in Hialeah,” she recalled. The family complained about Santeria sacrifices left at the base of their royal palm.